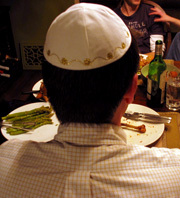 With the weekend comes Shabbat, or Shabbos: the Jewish day of rest. From sundown Friday to sundown Saturday, Jewish law forbids certain, very specific kinds of "work." That means you can't grab your briefcase and head out to the office. It also means you can't do very simple things we take for granted. Like writing, and erasing. Cutting, and tearing. Even turning the lights on and off. Thus, Sabbath observers have spent many a Friday afternoon taping down light switches, stashing away pens and pencils - even pre-cutting their fingernails and pre-tearing their toilet paper. Enter opportunity. In recent years, an industry has emerged which manages to merge modern convenience and this sacred time. Rebecca Sheir has more.